Now we'll need again more information about yourself. Create 3 pictographs for things you do like & 3 pictographs for things you do not like. Think about which information you want to share with others, which characteristics and attributes you think other people might find interesting and what makes you different from anyone else. By now, you are already a pro in creating pictographs and icons. So enjoy this little self-exploratory task and just draw, draw, draw. 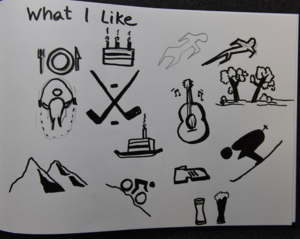 "I first started with the pictographs that represent “what I like”. As you can see it is a mixture of food, sports and the outdoors. Some of the pictographs worked out better, others did not work out at all. I also had to check for some icons on the internet in order to get inspired. I decided that in my final card, I would like to have a selection of music, outdoors/sports and beer. I thought that this would represent enough laid-back characteristic combined with some sports ambition. That fits me quite well. 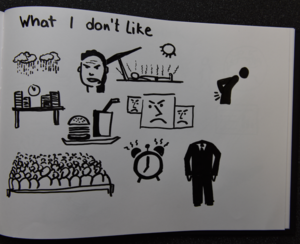 Then, I turned to the pictographs representing “what I do not like”. Again I had to think hard to figure out what a good combination for me could be. I try to avoid general aspects that everybody does not like, as e.g. traffic jams or robbery, etc. These will not tell a story about you. I felt and decided that the final set should be a combination of work related and private related icons." Part 1: "What I like"
Part 2: "What I don`t like"